The Comp gaming seat is the premier line of the Sparco Gaming Chairs. It is available in two versions: Comp C – Carbon Fiber (Carbonio) and Comp V – Fiberglass (Vetroresina). 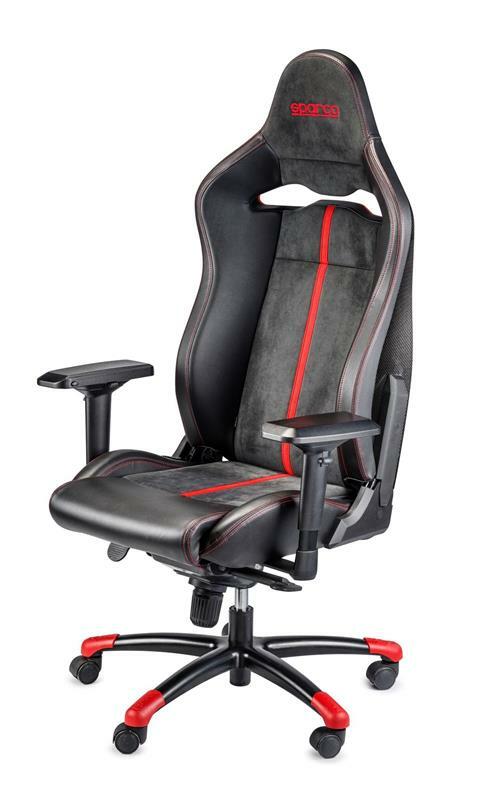 The Comp C gaming seat is the flagship Sparco product, fitted with a backrest in the same composite carbon fiber used for Sparco supercar seats. The Comp seat reflects the design and comfort of the Sparco SPX seat. Both Comp seats are upholstered in Alcantara® suede and synthetic leather, and allows the user to adjust the seat height and angle. The backrest reclines and provides fine lumbar adjustment. The backrest has a mechanism that stops it from tipping over by preventing the back from reclining by more than 150°. The Comp seats features a black aluminum base with colored TPU foot grips to prevent slippage during game play, an SGS/ BIFMAX5.1 / EN1335 certified piston, rocking mechanism and 5 sturdy wheels. The arms are type 4D with multi-directional movement. WARNING: This is not an automotive seat, DO NOT USE IN A VEHICLE.